Sautéed Chard with Feta and Black Olives, Thyme for Cooking late summer vegetables. Chard, or Swiss Chard, is a slightly bitter green, reminiscent of spinach. Mine is 'Rainbow Chard', thus all the colors. We added feta and Greek olives for a Mediterranean flavor. Add the chard stems and stir-fry over medium heat 3 minutes, then add the leaves. Stir and turn until the leaves wilt and it all fits into the skillet. Add the ketchup, vinegar and stir well to combine. Reduce heat to low and cook until chard is tender, another 4 - 5 minutes, stirring frequently. Crumble feta or cut into small cubes. 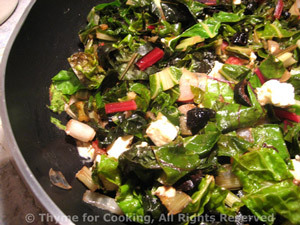 Remove chard from heat, stir in feta, oregano and olives. Serve.